I have 4 years of experience as Office Administrator & Receptionist. I am qualified with a Bachelor of Commerce and highly proficient in MS Office Applications. I have excellent spoken & written communication skills in English and an expert in handling people of diverse nature, and renowned for being an excellent team player. I possess excellent organizational skills & can work independently. In addition, I am well organized; systems oriented & have a strong attention to details. Please find my CV attached herewith for your kind reference. I am presently seeking employment as a Secretary/Document Controller or Human Resource Personnel. My more than 5 years’ experience with ___________ as Secretary/Document Controller/Receptionist and my several years of experience with ___________ as HR Officer have helped me develop skills and knowledge in office administration, documentation, secretarial works, people relation and communication. I am computer literate, with vast experience in MS office, Oracle, Tally ERP9, and correspondence writing. I am a hard worker with initiative to work, capable to work under pressure and with limited timeframe. Details of my previous work, duties and responsibilities, personal and educational background can be found in the attached CV. I would like to explain more about myself and what I can do for your company if you can give me a chance to meet you personally. I am available at your perusal anytime, you can contact me on my mobile or e-mail address mentioned above. I am writing to outline my successful track record as an Administrator and /front and back office with 5 years’ rich experience in Administration, customer service, business development, which I believe shall make a very significant contribution to meet the objectives of your esteemed organization while improving operational efficiency. During my career span, I have gained invaluable experience in building relations, account management, gain customer trust and increasing repeat and referral business. My forte includes maintaining all equipment’s, documentations, data entry, reception, procurement, cash management while ensuring compliance with SOP and procedures of the company. My extensive and successful experience covers a wide array of functions, including team leadership, facilities management, front office operations, general management as well as administration. I have displayed capabilities in designing and implementing quality control systems and procedures to minimize rejections and achieve highest quality standards. I have made significant contributions in building and nurturing relations with clients to ensure their retention and continued patronage. Senior management appreciated me and awarded me as an ‘Employee of the region’ for the month of October 2016. I am presently open for a challenging position as Administrator/Coordinator/Front Office. With a record of success behind me, I am confident that I will be an asset to you as well. I would be pleased to have the opportunity to discuss your needs and how I might be able to meet them. Please do not hesitate to call me at ____________. I thank you for your time and consideration and look forward to hearing from you. Well presented with exceptional customer service skills, and the ability to provide an effective reception and switchboard service. Experienced in working under pressure in a quick paced fast moving environment and able to receive guests on arrival in a friendly, helpful and approachable manner. Able to be an integral member of an administrative and clerical team, and can follow instructions and also have a willingness to learn. Currently looking for a suitable receptionist/Coordination position with a progressive company. * Can offer a warm & friendly greeting to visitors. * Ensuring an efficient running and operation of the Reception Desk. * Good organization and prioritization skills. * Self-motivated, proactive & hardworking. * Ability to listen and anticipate. * Fully aware of all Health & safety legislation relating to office work. * Experience of arranging month end invoicing on the SAGE System. * Good IT skills Word, Excel, Email and Internet. * Accept and adhere to the need for strict confidentiality. I would like to express my extreme interest on any available position in your esteemed organization. I have total 8 years’ experience handling all activities of 3 branches such as Operations, Legal works, marketing and Admin. - Safety Standards - OHSAS 18001:2007 Lead Auditor, NASP 30 Hours General Industry. In addition, I have conducted 4 days internal auditing in compliance with ISO 9001:2008. I can also help the organization to implement and get ISO certification or to perform internal audit if already certified. My updated CV is attached for your perusal. I request to kindly consider me for the above position. I am writing to apply for the above vacancy your prestigious company. For almost 3 years I have worked as office manager in a marketing research and development, which has enabled me to develop excellent office administration management skills. In addition, for 5 years I have worked as project admin support and promoted to document controller in a telecom company. I am now looking for a new challenge that will provide me with the opportunity to further develop my career. - Proven ability to work independently as a team member. - Ability to manage own workload and set priorities with little supervision. - Ability to multi-task, manage time effectively and handle tight deadlines. - Ability and desire to learn new skills. - Advance computer skills – Microsoft Office, MS Word, MS Excel, MS Project, MS Visio, Explorer, Outlook, PowerPoint, Adobe Photoshop, and Publisher. I would enjoy having the opportunity to talk with you to discuss my application and how I could use my skills to the company. I would like to apply for senior role as per my experience and Education. I have been working in the rent a car industry for 5 years as a branch supervisor, handling individually branch for daily activity, supervising the entire operation and direct the workforce as needed. Quick decision maker and able to handle the work load. Deep knowledge of Car Rental business functions. Capable of budget preparation and fiscal management. Ability to develop, plan and implement short and long range goal. Highly organized, goal oriented, and flexible. Strong interpersonal and analytical skills. Ability to foster a cooperative work environment. Ability to make evaluative judgments. I have enclosed my CV for your interest and I am happy to answer any questions that you may have regarding my skills and experiences. In each of previous job experience, I have performed my assignments with a high degree of skill and professionalism. My current objective is to obtain a position that will fully utilize my skills and offer an opportunity for continued professional growth. My positive attitude and willingness to give 100% makes me a valuable asset to any organization that would employ me. I look forward to hearing from you in the near future and hopefully to schedule an interview in which I hope to learn more about your company and how I may be able to contribute to its continued success and growth. Thank you for your time. - Strong background in all aspects of office management, from scheduling meetings and coordinating travel to overseeing budget and accounting functions. - Demonstrated capacity to develop and maintain comprehensive administrative processes that improve the efficiency of day-to-day operations. - Knowledge of computer operations including all Microsoft Office applications, proprietary software systems and Internet research. I would like to take this opportunity to put forward my CV for the position of Front Office Manager or Assistant Front Office Manager within your organization. My record of academic achievements and professional career history demonstrates attributes that make me a valuable employee. My CV is enclosed to provide you with details of my skills and accomplishments, but I am certain that a personal interview would more fully reveal my desire and ability to contribute to your organization. As my CV indicates, I have roughly 5 years of professional experience in operations management. I have worked as a manager and accountant in a firm, managing assistant in another department and as a customer service officer in separate banking firms. I am sure you are aware of the flexibility, focus and commitment such positions require. I want to bring forth the knowledge and insight gained through these various experiences to the company. * Broad based experience covering a full spectrum of administrative duties, including office management, billing/invoicing, customer service, account management, operations management. Finally, in all the previous positions I have held, I have approached them as opportunities for career advancement and discovery. I will bring the same entrepreneurial spirit and value added vision to your company. A more detailed list of my competencies can be found in the attached CV. Please feel free to Call/Email me for any required discussion. Thank you for your time. A high-performing Executive Assistant is an essential part of an executive’s or company’s continued success. I bring quantitative and knowledgeable expertise in the ability to oversee all scheduling, correspondence, itineraries as well as confidentially handle any and all functions as a trusted assistant. I believe you will agree that my qualifications, highlighted in the enclosed resume, amply demonstrate that I have the drive, track record of results and management experience that can contribute to your company’s growth as well as the administrative integrity you are looking for. * 11 years of experience as an executive assistance and office management, administration, management of financial resources, calendar and scheduling development, office asset management and technology integration. * Excellent operations experience in, report generation, business operation, project management, presentation materials and extraordinary prioritization skills. I am an enthusiastic individual with a positive attitude and excellent work ethic, who is comfortable in any position of responsibility. Joining your company will help me to get closer to my long term career goals, and I am very confident that I would fit in very easily into your existing setup. I sincerely hope that you will contact me in the near future to arrange an interview where we will be able to discuss my application further. I am a hardworking and dedicated worker and will never balk at any task, which has been handed over to me. I have a good confidentiality, which is highly appreciated by my past employers and which would be beneficial for your organization as well. I would like to meet you in person and discuss this opportunity further at your time and convenience. With over 2 years of experience in sales and Masters in Business Administration, I believe I have all the capabilities required for becoming an integral part of your sales team. Conscious of customer needs, I always strive to provide them with prompt and high quality service. On numerous occasions, I have received recognition from the management for my ability to go out of the way to serve customer needs. I possess excellent listening and oral communications skills, two qualities that I believe are paramount for this job. Review of my credentials will confirm that I am able to serve as a catalyst for achieving objectives and growth through effective contributions. I am an organized and dedicated individual with experience in sales and business development. The previous roles offered a challenging and competitive environment for demonstrating my technical skills as well as management & leadership skills. I have immense opportunities to conceptualize and execute complicated projects. I was extensively trained to sales, marketing operations and administrative jobs. The duties includes preparation of reports, letters for proposals, modifications, maintenance of records etc. Have a detailed understanding of technical and professional writing, and the use of Microsoft Office Suite. My flexibility in working as a team and adaptability towards new techniques and practice were appreciated. I understand that working for your organization requires a candidate who is hardworking, sincere, team oriented and is able to deal with people in various departments. I am confident that I possess these skills, which will help me to perform the job efficiently and effectively. My goal is to provide strategic contributions during every phase of the project and thus completing the projects in hand, retaining company values. I am certain that my presence in your company will prove to be an asset to your esteemed organization. I hope you will grant me an opportunity to meet you in person to discuss my application further. The manager of your company, Mr. Smith, has advised I contact you concerning the opening for an Administrative Assistant. Objective is to land a job as an Administrative Assistant working in a thrilling and professional environment with personal development and growth possibilities and to accomplish company's target through professional ethics, sincere commitment and hard work. A knowledgeable Administrative Assistant with verified track record with numerous Business Administration firms in the past four years. I am emphatic that all of this experience enables me to succeed in any relevant role. I possess all the essential and anticipated skills that will have a positive influence on this company. I am replying to your job post on www.vacancy.com for Administrative Manager. I wrote to you on (date) about Administrative Manager jobs in the area. I have enclosed another CV of my academic background and employment history. I am very interested in this position. Specialized Administrative Manager with seven years of working successfully in Business Administration numerous businesses. I am a hard-working individual who continuously looks for methods to advance efficiency and precision. In past roles, I brought up techniques to minimize [cost/risk] as well as methods to maximize [production/revenue/satisfaction]. I am committed to the values of quality and constant enhancement. While my enclosed CV provides a brief overview of my background, I look forward to a personal meeting at which time we ca discuss your requirements and my qualifications in detail. I will call you next week to arrange a meeting; in the meantime, you can contact me at the above numbers. Thank you in advance for your time and consideration. I got your email address from Mr. James who thought that it would be a great idea if you and I met and discussed the prospect of me working at your firm in the role of Clerk. Looking for Clerk role within Business Administration, in a role that ill best utilizes solid analytical skills. Spirited Clerk with more than five years of experience in all aspects of Business Administration. Entrepreneurial spirit with established capability to make improvements, directly contributing to business progress and increased profitability. Particular strength supervising people and controlling financial matters. Perhaps your organization could benefit from an Executive Assistant with a record of major contributions to business and profit growth. Business Administration graduate integrating work and education to accomplish career goals. Offers a total of ten years of progressive experience as an Executive Assistant. Expert time manager with tenacity and perseverance to handle pressure. Proficient in computers and MS Office suite. Your time in reviewing my confidential CV is greatly appreciated. I will follow up next week to answer any inquiries you may have regarding my qualifications. At that time, I would like to talk about the prospect of setting up a personal interview with you. Please contact me if you would like to speak sooner. I am writing you to inquire about any job jobs in your esteemed company for a dedicated and determined Office Assistant. Reputed Office Assistant armed with a commanding track record in Business Administration within fast-paced and highly competitive landscapes. You will notice one common thread throughout my career: I am a lateral-thinking negotiator and issue solver who knows how to pinpoint needs and achieve division and company-wise business objectives. With this vibrant approach, I have successfully gained recognition for consistent first-ranking achievements in Business Administration. In order to present my credentials more fully, I will follow up with a call to you to answer any inquiries you may have. Thank you for your consideration. I was recently talking to Mr. Jason from your company and he strongly recommended that I send you a copy of my CV. knowing the needs for the Office Coordinator position, he felt that I would be an ideal candidate. Capitalizing on my success working as an Office Coordinator for [Organization Name], I am looking for a professional opportunity where I can continue exploiting my skills in the benefit of my employer. Strategic Office Coordinator with three years of hands-on experience in greatly competitive Business Administration environments. Expertise in execution of prosperous department/business targets with an imaginative approach that ensures rapid delivery. If I sound like the person you need at [Organization Name], then contact me right away to discuss the Office Coordinator position. I can be reached on [mobile]. Your job post for the position of Office Manager showed up as part of my suggested job list on www.indeed.com. The people in charge of the job portal couldn't have done it any better because this role fits my qualifications just perfectly. A successful Office Manager with broad experience. Well known for my capability to improve and increase [profit/satisfaction/production]. My vibrant uncompromising style motivates change within the department/company and builds support from within the ranks. These skills, plus many more, would be true assets to a firm of your caliber. If you trust that you could benefit from a greatly motivated and capable professional with a reputation for generating results, then I would welcome the opportunity to meet and discuss the specific value I can offer your organization. I thank you for your consideration and I look forward to speaking to you soon. Reflecting on my Personal Assistant experience within the Business Administration field, it is at this point in my career I am seeking to chase a long-term personal and professional goal of a challenging opportunity as a Personal Assistant within a renowned organization. Three years of proven track record as a Personal Assistant. Skillful in all aspects of Business Administration. Well-developed skills, greatly motivated, passionate and committed to professional excellence. I am confident that my knowledge and expertise would allow me to make a meaningful contribution to the success of your firm and its clients. I would enjoy discussing with you in person how my capabilities can match your needs, and will contact you soon to organize a fitting time for an initial meeting. Thank you for your time and consideration. I look forward to talking to you soon. Mr. Smith, the branch manager, suggested that I contact you to find out whether there is an opening for a Secretary. I am pursuing an opportunity that will enable me to use my training and practical technical exposure in a Secretary position. As described in my CV, you will find a strong experience in Business Administration with more than eight years as a Secretary. In this capacity, I have established a proficiency in Business Administration. I am self-assured that my knowledge in these areas will prove to be an advantage to [Organization Name]. My CV is attached for your consideration. I have faith that I can make a positive contribution to [Organization Name] and look forward to discussing my credentials in detail. I will call you next week to organize for a meeting at a commonly convenient time. Thank you for your consideration. I received your name from Mr. Wesley last week. I spoke to him regarding career opportunities in the Business Administration domain and he advised that I contact you. He assured me that he would pass my CV along to you; however, in the event that he did not, I am enclosing another. Reflecting on my Typist experience within the Business Administration field, it is at this point in my career I am pursuing to chase a long-term personal and professional objective of a challenging opportunity as a Typist within a notorious organization. A well-qualified Typist bringing over five years of Business Administration experience. The scope of my experience includes, but is not limited to: ________. My focus is to deliver results and provide superior service by quickly identifying problems and developing a solutions to ensure they are resolved. My expertise lies in my solid ability to build rapport with others and manage all facets related to my appointed position and areas of responsibility. I find these abilities to be my greatest assets to offer employers. I would welcome the opportunity to discuss with you the Typist position and how I might make similar contributions to the success of [XYZ Inc]. I look forward to hearing from you to arrange a personal interview. I was delighted to learn of the latest opening for a Branch Manager. Upon reading my CV, you will immediately notice how my ten years' Automotive experience fits your requirements perfectly. My professional and academic background, along with my honest interest in helping others, has enhanced my compassion to a varied range of cultures. As a highly inspired Branch Manager, I enjoy the challenge of compound demanding assignments. My well-developed writing and communication skills are assets to any environment. I received your name last week from Mr. Jason, the branch manager of [Company Name], and he suggested I contact you for a possible Front Desk Manager position. In case the CV he forwarded is delayed in the mail, I enclose another. Looking to secure a challenging Front Desk Manager position within a forward thinking, progressive technology oriented company. Capable Front Desk Manager with exceptional Business Administration experience. Capability to maintain control of work of any size and complexity. Capability to perform autonomously and a preparedness to make choices. I am used to fast-paced ecosystems where deadlines are a primacy and conducting numerous jobs at the same time is part of everyday routine. I appreciate a challenge and work hard to achieve targets. A vigorous doer with exceptional personal skills. I am confident that my knowledge and expertise would allow me to make a meaningful contribution to the success of your company and its clients. I would enjoy discussing with you in person how my capabilities can match your needs, and will contact you soon to arrange an appropriate time for an initial meeting. Thank you for your time and consideration. I look forward to speaking to you soon. I am answering to the opening that was announced on www.jobsite.com for Front Office Executive. I'm sending you my CV detailing my education and professional career history. Reputed Front Office Executive with a remarkable track record in Business Administration within fast-paced and greatly competitive settings. You will notice one shared thread throughout my career: I am a lateral-thinking individual and problem solver who knows how to recognize requirements and attain enterprise wise goals. My broad background in all aspects of Business Administration coupled with my business operations expertise, are the assets I would bring to a position with one of your clients. As detailed in my CV, you will find a strong background in Business Administration with over eight years as a Front Desk Attendant. In this capacity, I have developed an expertise in Business Administration. I am confident that my experience in these areas will prove to be an asset to [XYZ Inc]. Please feel free to contact me at my number: [mobile]. Thank you for your consideration. My background, professionalism and interest will make me an effective member of any team. Mr. Jayce of Human Resources suggested that I contact you in regard to applying for a role of Front Desk Coordinator. If you have need of a well-qualified professional with exceptional skills and experience in _________ then we have good reason to meet. Eager to chase a career within Business Administration, building on newly attained skills attained from working as a Front Desk Coordinator. With a Master's Degree in Business Administration and over seven years' experience as a Front Desk Coordinator, I have developed a robust background in Business Administration. Consequently, I have developed effective quantitative skills and a practical understanding of the fundamental principles and conceptions associated with Business Administration. My CV will provide additional details concerning my academic background and professional experience. I have worked successfully both independently and as part of teams. I adapt readily to quickly changing work conditions and enjoy the prospect of contributing to the organization's reputation and success. I am open to relocation and would eagerly accept either contract projects or permanent employment. I believe that my capabilities would allow me to serve your needs and benefit your clients. I would enjoy meeting you to talk about my qualifications in greater detail. Please contact me via phone or e-mail to organize an initial interview. Thank you for your time and consideration. I look forward to speaking to you soon. I got your email address from Mr. Jack who thought that it would be a great idea if you and I met and discussed the prospect of me working at your company in the capacity of Front Desk Receptionist. Looking for Front Desk Receptionist position within Business Administration, in a position that will best utilizes solid methodical skills. Spirited Front Desk Receptionist with more than nine years of experience in all aspects of Business Administration. Entrepreneurial spirit with established ability to make improvements, directly contributing to business growth and increased profitability. Specific strength supervising people and controlling financial matters. If you need a Head Receptionist with confirmed international success who will really listen to your clients' needs then I am your number one choice for any opportunity in Business Administration. Capable Head Receptionist offering seven years of expertise in the Business Administration field. Awarded repeatedly for exceptional job performances. Goal-oriented, dependable, and analytical individual with broad knowledge of numerous Business Administration functions. I would like to meet you to discuss my credentials for the Head Receptionist position. Please call me at the following telephone number, or leave a message, to organize an interview. Thank you for your consideration. Lately I have been examining the leading local businesses in Business Administration. My search has been for companies that are respected in the field of Business Administration and that provide ongoing training programmes. The name of [Firm Name] keeps coming up as a top company. Currently seeking a diversified and challenging career in the Business Administration field, preferably as an Administrative Receptionist. Devoted Administrative Receptionist with a long and prosperous history in increasingly responsible positions within the Business Administration field, gaining extensive experience through working with highly skillful people. My greatest strength lies in my ability to communicate with all types of people and different levels of professionals. My CV is attached for your consideration. I trust that I can make a positive contribution to [Firm Name] and look forward to discussing my credentials in detail. I will call you next week to arrange for a meeting at a mutually fitting time. Thank you for your consideration. Your advertisement for Group Services Manager caught my attention because my background appears to parallel your needs. Please refer to the enclosed CV for a summary of my qualifications. I am sure you have been flooded with hundreds of capable applicants. Please allow me to explain why you would want to call me first. All rounded Group Services Manager having considerable years of experience in all aspects of Business Administration. I trust I can deliver optimal results. My record of educational accomplishments and professional career history, establish attributes that make me a beneficial employee. I am a self-motivated individual with good communication and interpersonal skills. It is with continued interest and enthusiasm that I respond to your announcement for Mailroom Manager. I believe that my education and experience combine to create an immaculate match for the position and would appreciate careful consideration of my credentials as presented below and within my CV, enclosed. A visionary, forward-thinking Mailroom Manager offering eight years of progressive growth and outstanding success across numerous Business Administration firms. Outstanding negotiation and relationship administration skills with ability to motivate teams to outperform expectations. I received your name last week from Mr. Jack, the branch manager of [XYZ Inc], and he suggested I contact you for a possible Meeting / Event Manager position. In case the CV he forwarded is delayed in the mail, I enclose another. Pursuing an opportunity as a Meeting / Event Manager within a dynamic, forward-thinking organization supplying opportunities to progress intellectually, personally and professionally. Greatly motivated, versatile and creative Meeting / Event Manager with Master's Degree in Business Administration. Over four years' experience in the domain of Business Administration. Robust support experience in office atmosphere with expertise in research and writing. Excited to excel, learn quickly, personable, and appreciated among peers. Should any inquiries arise concerning the info on my CV, or if you need personal references, please do not hesitate to contact me through the address or telephone number listed above. Thank you for your time and consideration. I look forward to meeting you. If your company is searching for a confident and competent Night Manager then I might just be the perfect fit for the role. Business Administration professional recognized for his cutting-edge skills. More than ten years' experience as a Night Manager. Adapts readily to changing technologies. Rare blend of theoretical and practical understanding of the different work environments. I look forward to hearing from you in the near future to discuss any commonly valuable opportunities. If you do not at present have a need for a professional with my experience but know of someone who may, please be so kind as to pass my letter and CV on to that individual, or simply call me. As a proficient professional with three plus years of outstanding track record in the Business Administration field, I trust that I have exclusive capacities that could benefit Companies of all sizes. With this in mind, I have enclosed for your review a CV that briefly outlines my professional history. A totally proficient Business Office Manager with direct experience in Business Administration. Holder of Master's Degree in Business Administration. Punctual, reliable, methodical, good at handling a variety of tasks efficiently, with strong ability for organization and administration. I am convinced that my experience and professional diligence could be an asset, and would appreciate any referrals you might be able to give me for potential employment opportunities. Please sense free to pass my CV on to anyone who may have a suitable opportunity, or give me a call on [mobile]. Thank you in advance for your assistance. I look forward to talking to you soon. I would very much hope to join a company where I can learn and grow within the Business Administration profession and build a long-term relationships. With these goals in mind, I have enclosed for your attention and review a CV that briefly summaries my credentials as a Branch Office Administrator. I am looking for your help in sharing my resume with clients have needs in line with my experience. Highly trained and credentialed Branch Office Administrator with more than eight years of experience in Business Administration. Strong ability to conceptualize and implement plans and manage details required to execute effective operation. In the course of your search assignments, you may have a need for an organized and goal-directed Office Supervisor. My present position provides me with the credentials and experience essential to successfully fulfil such a position. A greatly professional, confident and determined Office Supervisor, with over six years' experience within a variety of roles in the Business Administration field. Self-motivated, reliable and diplomatic, with an exhibited ability to multi-task, working calmly and rationally under pressure while maintaining a positive attitude. Displays high levels of integrity, a solid team player who also enjoys a degree of autonomy and independence. I have a strong desire to move into a business environment where my skills can be completely employed in successfully furthering a leading firm's business objectives. I am confident that my knowledge and expertise, along with my committed professionalism, would allow me to make a substantial contribution to your client's success. I would enjoy meeting you or one of your clients to discuss the possibilities further. Thank you for your time and consideration. I got your email address from Mr. Jacob who thought that it would be a great idea if you and I met and discussed the possibility of me working at your company in the capacity of Administrative Support Supervisor. My objective is to land a position as an Administrative Support Supervisor and to pursue new opportunities with a company providing new challenges while making major contributions to the overall success. A passionate Administrative Support Supervisor with an impressive academic record and valuable experience within dynamic environments. Adopts a logical and analytical approach to business. Established ability to devise creative solutions to problems. Demonstrates the highest levels of company and prioritization in order to meet tight deadlines, and possesses remarkable social and people skills. I would greatly appreciate a few minutes of your time to discuss my options and glean any suggestions you can offer. I'll telephone you in a few days to see if we can organize a brief meeting. Thanks very much. If any of your clients requires a persistent and well-versed Office Administrator, then you may want to consider me as a serious prospect for the role. Proficient Office Administrator with three years' experience and a verifiable record of providing enhanced productivity. Highly effective teambuilding and motivational skills. As you can see from my resume, I have broad Business Administration EXPERTISE. I succeeded in [some accomplishment] and I worked as a Registry Administrator for more than nine years. I developed some original ways of [handling tasks or responsibilities] that would be valuable to your company. Looking for to draw upon the skills and experience gained across a variety of roles to land a role in Business Administration. I have faith that I can be an asset to your organization and would enjoy discussing further how my knowledge, expertise and professional devotion can address your needs in the Registry Administrator position. Please feel free to contact me to arrange either a telephone or in-person interview at a commonly convenient date and time. Thank you for your time and consideration. I look forward to talking to you soon. I received your name last week from Mr. Bradley, the branch manager of [Organization Name], and he advised I contact you for a possible Document Controller position. In case the CV he forwarded is delayed in the mail, I enclose another. My objective is to land a position as a Document Controller in the Business Administration domain with an established organization repeating the contributions that I have made to my previous employers. Dedicated Document Controller possessing more than ten years of progressive experience. Confirmed track record of executing and supplying initiatives that positively contribute to a company's bottom line. I am very self-sufficient and able to work independently with little supervision. I am considered as an information resource and enjoy sharing my knowledge with others. I also enjoy managing projects and planning meetings, trips and special events. I am open to relocation and would eagerly accept either contract projects or permanent employment. I trust that my competences would allow me to serve your needs and benefit your clients. I would enjoy meeting you to talk about my qualifications in greater detail. Please contact me via phone or e-mail to organize an initial interview. Thank you for your time and consideration. I look forward to speaking to you soon. Mr. Jordan, your office manager and my neighbor, thought I should contact you about the upcoming Document Management Specialist vacancy in your department. I am interested in being considered for Document Management Specialist position or a similar role at [Firm Name]. Acknowledged Document Management Specialist with performance excellence, an unrelenting results focus, and aggressive implementation for over seven years, underscored by an indelible commitment toward ethical business practices and superior service. My expertise, enforced by strong educational background, has been honed in providing change that exceeds business objectives for productivity. More than ever, good corporations need confirmed performers who can get results in competitive industries and a tough economy, whether working independently or leading teams. If you are in need of a Program Coordinator, please consider my track record. Spirited Program Coordinator credited with driving remarkable results through years of work in the Business Administration field. Tenacious by nature, characterized by the love of boosting performance and productivity. I am confident that my education and experience to date provide me with skills that would be valuable to your firm and its clients. I would enjoy speaking to you in person to talk about the opportunities that exist and how I can best serve the requirements of your company. Please call me on [mobile] to arrange a convenient date and time for us to meet. I look forward to vacancy a dialogue with you soon. My broad background in all facets of Business Administration coupled with my business operations expertise, are the assets I would bring to a position with one of your clients. Well-rounded experience in Business Administration and seven years' track record in various Project Coordinator positions. I trust I have the exhibited skills that can benefit your company. In addition, I realize it is hard-working and cooperative people who deliver results. My focus on teamwork and productivity has proven successful in my past assignments. My solid background in Business Administration supported by broad experience as a Technical Project Manager are key assets that I can contribute to one of your client's future success. A well-qualified Technical Project Manager bringing over six years of Business Administration experience. The scope of my experience includes, but is not limited to: ________. My focus is to deliver results and provide superior service by quickly recognizing issues and developing a solutions to ensure they are resolved. My expertise lies in my strong ability to build rapport with others and manage all aspects related to my appointed position and areas of responsibility. I find these abilities to be my greatest assets to offer employers. I am assured that my experience and professional diligence could be an asset, and would appreciate any referrals you might be able to give me for potential employment opportunities. Please sense free to pass my CV on to anyone who may have a suitable opportunity, or give me a call on [mobile]. Thank you in advance for your assistance. I look forward to talking to you soon. Accreditation Specialist with extensive experience in Business Administration procedures and best practices. Skillful in all areas of Business Administration including: _______. Excellent organizational, team-building and communication skills. I have always followed the performance of your company on www.jobsonline.com. Your record over the last ten years shows exceptional [portfolio management]. Because of my experience with one of your competitors as an Accreditation Specialist, I know I could make significant contributions. My objective is to land a position as an Accreditation Specialist and to pursue new opportunities with a company offering new challenges while making significant contributions to the overall success. Ten years' experience in Business Administration gained through various roles mainly as an Accreditation Specialist. Demonstrated experience in integrating strategies, innovation, technology and team building to accomplish successful results. Should any inquiries arise regarding the info on my CV, or if you need personal references, please do not hesitate to contact me through the address or phone number stated above. Thank you for your time and consideration. I look forward to meeting you. If you are presently searching for a competent Accreditation Specialist for one of your many clients, then I think that you need to take a look at my resume because you may just find exactly what you are looking for. Detail-orientated, highly inspired Accreditation Specialist with six years' prosperous experience in Business Administration. Keen problem solving skills shown by ________. Effective communicator who easily interfaces with end-users, technical teams and professionals on all levels. I am confident that my education and experience to date provide me with skills that would be valuable to any firm. I would enjoy talking to one of client's in person to talk about the possibilities that exist and how I can best serve their needs. I look forward to vacancy a dialogue with you soon. Business Administration professional recognized for his cutting-edge skills. More than eight years' experience as an Accreditation Specialist. Adapts readily to changing technologies. Rare blend of theoretical and practical understanding of the different work environments. I am interested in being considered for Accreditation Specialist position or a similar position at [ABC Company]. I would very much like to talk about career opportunities with [ABC Company]. I will be calling you within the next few days to set up an interview. In the meantime, if you have any questions I may be reached at the [mobile]. Thank you for your consideration. If your organization seeks an Accreditation Specialist to advance your Business Administration department, then consider my established track record. I am ready for a challenge as your recent progress needs someone used to working with new subsidiaries and maintaining the bottom line. Multi-talented Accreditation Specialist with an established track record of accelerating growth by incorporating Business Administration best practices. Gifted consensus builder, cultivating meaningful relationships and rallying internal and external players behind win-win propositions. Prospers in fast-paced environments. I would appreciate the opportunity to meet you to discuss your goals and how I can help you meet them. I will call you soon to arrange a meeting. In the meantime, please feel free to call for further information on my background and experience. Thank you for your attention and reply. I look forward to meeting you in the near future. I wanted to work for a company like yours for such a long time and now that you have a post for Commissions Processor, it is like a dream coming true. The similarity of your requirements and my offerings is stunning. I urge you to take a look at my CV and see that for yourself. A smart, intelligent, veteran Commissions Processor with an extensive background in Business Administration. Creative, adaptable and versatile with first-rate skills, and an excellent sense of acumen. I welcome the opportunity to elaborate on how I could make a substantial contribution to your company as a Commissions Processor. I look forward to talking to you soon. Thank you. [ABC Inc] caught my attention recently as I began a search for a new employer in Sydney. Your company has created a setting in which people can excel, which is why I write to you today. I am very interested in joining your team and I am confident that my background and experience in Business Administration will meet your future needs. I am presently pursuing a stimulating opportunity in the role of Commissions Processor with a focused, growth-orientated organization. A fully competent Commissions Processor with direct experience in Business Administration. Holder of Bachelor's Degree in Business Administration. Punctual, reliable, methodical, good at handling a variety of tasks efficiently, with strong ability for organization and administration. This letter is to signal my interest in fit Commissions Processor openings in Washington. Please spare a moment to brush over my CV and share it with clients who are looking for such talent. A highly motivated Commissions Processor with more than ten years' experience in all aspects of Business Administration with the confirmed capability to develop specialized strategies and solutions. Effective at motivating others to accomplish individual and organizational targets with prosperous sales methods and training procedures. Commissions Processor with eight years' experience in Business Administration and a Master's Degree in Business Administration. Innovative, trained, greatly competent and veteran in all types of Business Administration practices. Capitalizing on my success working as a Commissions Processor for [Firm Name], I am looking for a professional opportunity where I can continue exploiting my skills in the benefit of my employer. I trust my skills and experience will make me succeed in the position of Commissions Processor. Kindly review my CV, then contact me at your earliest convenience to schedule a professional interview. Do you need an experienced, versatile Commissions Processor who can improve on existing practices and provide world class service? A skillful Commissions Processor with a pleasant, outgoing manner, a honest interest in success and a robust desire to provide [clients/staff] with the best possible experience. Your job posting no. 91801 for the position of Executive Officer cited the need for drive and creativity. I thought a good way to establish my drive and ingenuity was to deliver my CV in this priority email as it perfectly relates to the vacancy. Talented and dedicated Executive Officer with strong educational background in Business Administration. Comfortable with a variety of disciplines and interested in gaining more knowledge. Having work experience of more than three years in Business Administration roles. You and I haven't spoken before but Mr. Cooper thinks we might have an interesting conversation, especially if you anticipate the need for an industrious young Executive Officer who comes equipped with a great education and a great desire to start at the bottom learning from an acknowledged master in the field. Currently, I am exploring opportunities in the Business Administration field where I can contribute in the role of Executive Officer. Greatly trained and credentialed Executive Officer with more than six years of experience in Business Administration. Robust ability to conceptualize and implement plans and manage details required to execute effective operation. I am open to relocation and would eagerly accept either contract assignments or permanent employment. I trust that my abilities would allow me to serve your needs and benefit your clients. I would enjoy meeting you to talk about my credentials in greater detail. Please contact me via phone or e-mail to organize an initial interview. Thank you for your time and consideration. I look forward to speaking to you soon. As a leader in the placement market, it is my pleasure to share my CV with a reputable employment agency as yours. I am presently looking for an opportunity for an Executive Officer role, and would pursue your help in matching me with a suitable vacancy. Award-winning, widely respected Executive Officer specializing in Business Administration. Expert qualifications in merging modern technologies and new products. Known for attention to details and ability to deliver outstanding performances. Competitive, dependable, and veteran Executive Officer with more than seven years of experience in Business Administration. Strength in planning and multi-tasking. Reputation for robust organizational skills and high standards of work. I am very interested in joining your team as an Executive Officer or similar position that matches my qualifications. Thank you in advance for taking a few moments to review my CV. I am confident that the experience you'll find listed will be valuable to your company. Kindly contact me at your earliest convenience to schedule a professional interview. Because of current market conditions and high unemployment, I am sure you have several applicants and few Executive Officer jobs to fill. Please allow me to give a few reasons why you might want to call me ahead of other capable applicants should a suitable position become available? More than nine years of experience as an established Executive Officer. Offers integrated experience working with stakeholders and significant players. Weathered issue solver, able to diplomatically balance the vibrant needs of resourceful teams and corporate leaders in achieving deadline-driven productivity. Known for sharp attention to details and pragmatic work style. Your job Ad no. 82443 for the position of Keyboard and Data Entry Operator quoted the need for motivation and imagination. I believed that an excellent way to showcase my qualities was to send my CV in this message as it closely relates to the job. Strategic Keyboard and Data Entry Operator with four years' experience in Business Administration. Objective and deadline oriented with four years' experience. Proficient at working with numerous teams and stakeholders. The manager of your company, Mr. Jayce, has suggested I contact you regarding the vacancy for a Keyboard and Data Entry Operator. Objective is to land a job as a Keyboard and Data Entry Operator working in an exciting and professional setting with personal development and development opportunities and to achieve company's goal through professional ethics, sincere commitment and hard work. A highly professional, confident and ambitious Keyboard and Data Entry Operator, with over ten years' experience within a variety of roles in the Business Administration field. Self-motivated, reliable and diplomatic, with a proven ability to multi-task, working calmly and rationally under pressure while maintaining a positive attitude. Displays high levels of integrity, a strong team player who also enjoys a degree of autonomy and independence. I am presently searching for Business Administration in Wales and would like to kindly ask you to consider me if any of your numerous clients has such a requirement. A highly capable Keyboard and Data Entry Operator with seven years' progressive experience working in the Business Administration field. Enthusiastic, emphatic and motivated individual with robust multi-tasking and problem-solving skills. Exhibits key leadership qualities, including lateral thinking, empathy and reliability and prospers on undertaking new and exciting challenges. A dedicated, numerate and greatly sought-after Keyboard and Data Entry Operator with seven years' experience acquired by working for two of the leading Business Administration firms. Excited and results-driven with an instinctive capability to pay close attention to details. Currently pursuing a diversified and challenging career in the Business Administration field, preferably as a Keyboard and Data Entry Operator. Thank you for your consideration. I possess excellent hands-on knowledge as well as supervisory expertise, and I look forward to meeting you personally so that we ca talk about how I can make a positive contribution to your team. If you are looking for a prosperous Keyboard and Data Entry Operator to fill in a possible vacancy, you will be interested in talking to me. A self-confident Keyboard and Data Entry Operator with a Master's Degree in Business Administration. Recognized as focused, rational and open-minded with valuable work experience attained throughout different roles in the Business Administration field. Driven by the desire to accomplish significant results, displaying confidence, commitment and a positive 'can-do' approach at all times. I am confident that this experience equips me for success as your Keyboard and Data Entry Operator. Kindly review my CV, then please contact me at your earliest convenience to arrange a professional interview. Your job ad no. 21976 for the Key Account Assistant position mandated the need of an individual with strong enthusiasm and resourcefulness. I would really like to associate myself with this opportunity as my experience in Business Administration and my qualities, as outlined in my CV, closely relate to the post. An excited Key Account Assistant with a remarkable academic record and valuable experience within active environments. Adopts a logical and systematic approach to business. Demonstrated ability to devise inventive solutions to problems. Demonstrates the highest levels of company and prioritization in order to meet tight deadlines, and exhibits outstanding social and people skills. I received your name last week from Mr. Coleman, the branch manager of [Company Name], and he suggested I contact you for a possible Key Account Assistant position. In case the CV he forwarded is delayed in the mail, I enclose another. Looking to land a challenging Key Account Assistant role within a forward thinking, progressive technology focused company. A determined and innovative Key Account Assistant who enjoys being an integral part of or leading a team. Displays a strong commitment to deliver client value and is quick to grasp new ideas and concepts. Exhibits outstanding problem-solving and methodical capabilities, good networking skills and is able to communicate concisely at all levels. Highly motivated, passionate and well organized with an inborn ability to work well under pressure. If I sound like the person you need at [Firm Name], then contact me right away to talk about the Key Account Assistant position. I can be reached on [mobile]. I was looking for the top employment agencies in Denver, and your organization name keeps on popping everywhere I go. It is for this reason that I have decided to send you my cv first in case any of your clients is searching for a highly capable Key Account Assistant. A career driven, well-organized Key Account Assistant with a Master's Degree in Business Administration. Acquired a strong understanding of Business Administration methods during studies and work experience. Showcases well-defined methodical skills and an ability to work well in a team and on own initiative. Demonstrates superb organization, leadership and planning capabilities combined with an ability to communicate effectively at all levels. A complete picture of my expertise and experience is very important. I look forward to speaking to you soon to answer any queries you may have regarding my background. A well-qualified Key Account Assistant with three years' experience working in the Business Administration field. Exhibits an inborn capability to lead and stimulate team members and bring out the best in them. An experienced Key Account Assistant seeking to exploit broad skills gained in the Business Administration field. The enclosed CV summarizes my credentials and achievements. I would be glad to talk about any of this info with you as an opportunity for employment. Because 'proven skills' are best explained in person, I look forward to our conversation and will call early next week to arrange a meeting. Thank you for taking the time to review my CV and for your consideration. Perhaps your company could benefit from a Key Account Assistant with a record of major contributions to business and profit growth. A greatly analytical and self-motivated Key Account Assistant with a Master's Degree in Business Administration and broad experience in Business Administration. Ingenious and subtle with strong people management skills and an inborn ability to enthuse and stimulate teams. After reviewing the enclosed CV, please contact me on [mobile] to organize an interview. Because 'proven skills' are best described in person, I look forward to discussing how my credentials can meet your personnel requirements and contribute to your company's important mission. The job post no. 92326 for the position of Meeting / Event Assistant indicated the need for ambition and inspiration. 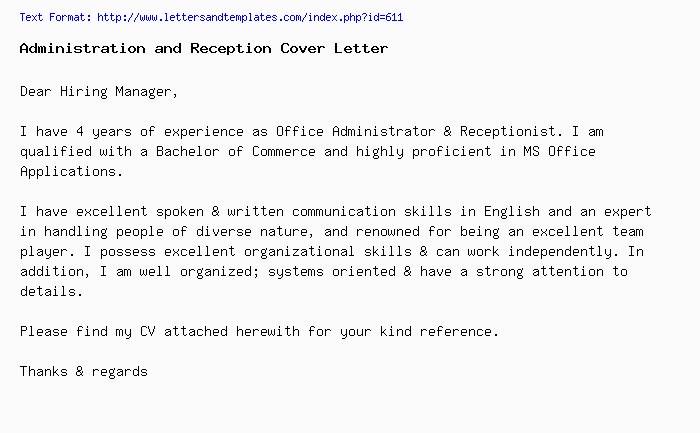 What better way to demonstrate how my qualifications fit the description than to share my resume in this email. A systematic and highly passionate talented Meeting / Event Assistant with over five years' progressive experience within the Business Administration field. Exhibits a demonstrable track record of managing tasks and projects. Excellent delegation and influencing skills with a proven ability to reliably meet deadlines and successfully handle crisis situations. Inspired by challenge and prospers on high levels of autonomy and responsibility. If you trust that you could benefit from a highly inspired and talented professional with a reputation for generating results, then I would welcome the opportunity to meet and talk about the specific value I can offer your organization. I thank you for your attention and I look forward to speaking to you soon. Mr. Jordan, your office manager and my neighbor, thought I should contact you about the upcoming Meeting / Event Assistant opening in your department. I am pursuing to chase a career as a Meeting / Event Assistant working for a progressive organization that acknowledges commitment, dedication and hard work. Meeting / Event Assistant with an impressive track record of excellence in the Business Administration field. Established interpersonal and communication skills. Renowned as self-motivated and enthusiastic with a talent for generating new ideas and exceeding expectations. As a prominent employment agency, you must receive hundreds of CVs every day. I am a little more than your usual average candidate, which is evident from my detailed CV. Trying to land a Meeting / Event Assistant job in Moscow. A well-respected Meeting / Event Assistant with six years Business Administration experience. Exhibits a demonstrated track record of providing business excellence. Reputed as passionate and results-driven; pays close attention to details. A self-motivated Meeting / Event Assistant with eight years' experience gained in a variety of positions in Business Administration. Able to communicate successfully with people at all levels and has steadily been commended for exceeding expectations. Demonstrates solid multi-tasking and organizational skills, and exhibits an insatiable appetite for learning new skills and developing oneself. Prospers on working in fast-paced, demanding environments that reward hard work and determination. Pursuing to utilize relevant work experience to land a position as a Meeting / Event Assistant for a leading Business Administration organization. While my CV is comprehensive, it does not completely demonstrate the manner in which I have achieved success. My character, personality and the ability to lead a project or team effectively could be shown in a personal meeting. Therefore, I would welcome an interview to talk about your requirements and my qualifications further. Thank you for your time and consideration. If your organization is in search for a personable and experienced Meeting / Event Assistant then you may want to consider me as your top choice. A driven and profit driven Meeting / Event Assistant with wide ranging experience in Business Administration. A well-respected, disciplined individual with a natural capability to manage, motivate and inspire teams under extreme conditions. Accustomed to recognizing and implementing viable solutions to improve work. Showcases integrity, loyalty and an enviable flair for business. I read your job posting on your company's website on 17 July for the Operations Analyst role and felt I had to respond since my credentials match precisely your requirements. An ambitious, dependable and greatly confident Operations Analyst with over four years' experience working within a variety of Business Administration environments. Well-organized, disciplined and efficient combined with an instinctive ability to multi-task. I was recently talking to Mr. Charles from your organization and he strongly suggested that I send you a copy of my CV. knowing the requirements for the Operations Analyst position, he felt that I would be an ideal candidate. Aiming to purse a full-time position as an Operations Analyst in your greatly respected company. An intelligent and committed Operations Analyst with five years' experience in the Business Administration field. Thrives on working in fast-paced, stimulating and highly driven environments. Energetic, focused, passionate and driven with a reputation for working with high-performance teams. Should my qualifications meet your needs, I would be available to organize a meeting immediately. I will call your office next week to answer any queries you may have and to set up a commonly convenient appointment. Thank you for your consideration. You have recently helped one of my friends sign a very nice job offer with a well-established employer. He had nothing but utmost praise for you and your outstanding services. I was fascinated and encouraged by his experience and decided to give it a shot myself. I hereby enclose my CV for you to review and consider for any suitable Operations Analyst opportunities. A skilled and experienced Operations Analyst with progressive experience in Business Administration. A highly efficient, personable Business Administration graduate with outstanding skills, and the ability to prioritize a challenging workload. I have attached a CV that will highlight and support my objectives. I would appreciate the opportunity to meet you or your clients and exchange ideas. Thank you very much in advance. Looking for to secure full-time employment making use of varied experience gained in the Business Administration sector. I have faith that my exclusive strengths can contribute to the development of [Firm Name], particularly if you are able to secure departmental status. I welcome the opportunity to discuss my continued involvement in your success. If your organization is searching for a confident and efficient Operations Analyst then I might just be the perfect fit for the role. Enthusiastic, inventive and hard-working Operations Analyst with exhibited prosperous experience. Reputation for offering excellent work results to increase [sales/productivity]. Enthusiastic to translate ten years of strong experience in the benefit of a reputable client. I have a strong desire to move into a business setting where my skills can be totally employed in effectively furthering a leading firm's business objectives. I am confident that my knowledge and expertise, along with my dedicated professionalism, would allow me to make a significant contribution to your company's ongoing success. I would enjoy meeting you to discuss the possibilities further. Please contact me to organize a suitable date and time for an interview. Thank you for your time and consideration. I look forward to speaking to you soon. I saw your job post on your website on 14 November for the Parts Receiver position and sensed that I had to reply given my credentials match precisely your needs. Ambitious, high-performing Parts Receiver with ten year's track record of success within the Business Administration field. Recipient of numerous prestigious awards for regularly exceeding goals. I received your name from Mr. Liam last week. I spoke to him regarding career opportunities in the Business Administration field and he suggested that I contact you. He assured me that he would pass my CV along to you; however, in the event that he did not, I am enclosing another. I would like to employ and develop skills and knowledge attained from the Master's Degree in Business Administration degree and previous jobs, to secure a challenging and progressive Parts Receiver position with a leading company. Ambitious Parts Receiver with seven years' experience in Business Administration. Master's Degree in Business Administration from University of Michigan. Strong organization and multitasking skills. I recently learned of your firm's remarkable record of matching applicants of Business Administration with top companies. I am a serious contender for any of your client's Parts Receiver vacancy. Parts Receiver with more than eight years' experience in time-sensitive, fast-paced environments. Highly developed oral and written communication skills, multitasking, attention to details, and perseverance to completion. Keen insight into clients' perspectives, targets and target audiences. Skillful with various software programs including Word, Excel, Access and Goldmine. Should any inquiries arise regarding the info on my CV, or if you need personal references, please do not hesitate to contact me through the address or phone number listed above. Thank you for your time and consideration. I look forward to meeting you. Parts Receiver with over eight years' experience in Business Administration. Regularly surpasses objectives and business targets. Quick learner and an excellent communicator with capability to perform well in a multitasking environment. Imaginative and skilled analyst with solid problem-solving skills offering exceptional systems expertise (conversions, upgrades and training), excellent computer and internet skills. Pursuing to secure a stimulating position as a Parts Receiver in order to complement and develop existing competencies, skills, education and experience in Business Administration. I understand that you will receive a large number of applications for this role. I do, however, have faith that my motivation, commitment and pre-existing skills will allow me to fit into your work setting and immediately start supporting the needs of your organization. I would appreciate the opportunity to meet with you to discuss my application at an interview. I have attached a copy of my cv for your consideration. I can be contacted at all times on my mobile phone [mobile]. If your organization is looking for proficient and dedicated Parts Receiver then I would like to present myself as the best candidate for the job. Over four years' experience in Business Administration positions. Exhibits solid commitment to maintaining highest level of work quality while driving development through multiple strategies. I am confident that my education and experience to date provide me with skills that would be valuable to your firm and its clients. I would enjoy speaking to you in person to discuss the opportunities that exist and how I can best serve the needs of your company. Please call me on [mobile] to arrange a fitting date and time for us to meet. I look forward to opening a dialogue with you soon. I read about your need for Process Expert on your company's website and felt I had to apply because there is almost no gap between what you need and what I can offer as you will clearly notice when looking at my resume. Innovative Process Expert with key domestic and international experience in Business Administration. Results-orientated and visionary achiever with proven success in numerous roles in more than five years. Polished communication, presentation, negotiation and problem-solving skills. Prospers in intensely competitive, active environments. I will be in the area later in the month, and hope we can meet at that time to discuss the Process Expert position. I look forward to hearing from you concerning this role. Thank you for your time and consideration. Mr. Cooper of Human Resources advised that I contact you in regard to applying for a position of Process Expert. If you have need of a well-qualified professional with exceptional skills and experience in _________ then we have good reason to meet. Eager to pursue a career within Business Administration, building on newly acquired skills attained from working as a Process Expert. Skilled Process Expert supplying exceptional Business Administration experiences for the last eight years. Active and goal-focused Process Expert with solid qualifications. Exceptional time-management skills and computer-literate. My CV, pasted below and attached, will flesh out my general background. I hope this executive briefing helps you use your time successfully today. I am ready to make a move and very much interested in the Process Expert position. I hope we can talk soon. I am forwarding my CV as I understand that you specialize in the Business Administration profession and have helped several professionals before in landing great jobs in the market. Top-producing Process Expert with eight years of experience in world-class organizations. Goal-driven manager dedicated to developing outcomes that benefit the company. I have attached my CV for your review. Should you be conducting a search for someone with my background at the present time or in the near future, I would greatly appreciate your consideration. I would be pleased to discuss my background more totally with you on the phone or at a personal interview. Organized and responsible Process Expert with more than six years' experience across diverse industries. Educated and spirited professional, quick learner with outstanding computer skills and exclusive ability to manage numerous tasks in a demanding environment. Outstanding communicator seeking a stimulating position using current skills and abilities, with the opportunity for professional growth. Pursuing an opportunity as a Process Expert within a dynamic, forward-thinking company providing opportunities to progress intellectually, personally and professionally. It is hard to summarize my work in writing. The only way I can imagine providing you the opportunity to examine my credentials is for us to talk to each other. I look forward to hearing from you to discuss the Process Expert position. Please call me at [mobile]. If your company trying to hire a progressive and enthusiastic Process Expert then I'm very interested in discussing this opportunity with you. Dedicated, results-orientated Process Expert with capability to build rapport at all levels. Prosperous track record in motivating coworkers to obtain maximum performance. Enjoys working in a fast-paced challenging environment. I enclose a copy of my CV, and look forward to exploring any of the ways you sense my background and skills would benefit [Company Name] in the role of Process Expert. While I prefer not to use my employer's time taking personal calls at work, with discretion I can be reached at [mobile] to initiate contact. However, I would rather you call me in the evening. While surfing your site, I couldn't help notice that you have a post for Schedule Officer. I'm seizing the opportunity and lending myself as the perfect fit for the above-named post. Task-orientated, ingenious Schedule Officer supplying diversified background highlighted by substantial demonstrable and documented accomplishments. Instinctive ability to stimulate and empower cross-functional groups to accomplish goals and resolve complex issues. I would like to talk to you about your personnel needs and how I am able to contribute to your department's goals in the position of Schedule Officer. I know that CVs help you sort out the probables from the possibles, but they are no way to judge the personal caliber of an individual. I would like to meet you and establish that along with the credentials, I have the professional commitment that makes for a prosperous team player. I got your email address from Mr. Jason who thought that it would be a great idea if you and I met and discussed the possibility of me working at your company in the role of Schedule Officer. Looking for Schedule Officer position within Business Administration, in a role that will best utilizes strong analytical skills. Accomplished Schedule Officer with eight years' experience and a verifiable record of offering enhanced productivity. Greatly effective teambuilding and motivational skills. I would welcome the opportunity to talk about with you the Schedule Officer position and how I might make similar contributions to the success of [XYZ Inc]. I look forward to hearing from you to organize a personal interview. A colleague of mine, Mr. Weston, suggested your company to me as you lately assisted her in a strategic career move. I understand that your company specializes in the Business Administration field. Skillful Schedule Officer with strong affinity for solving problems and supplying results. Proven talent for pinpointing business needs and finding corresponding solutions. I would enjoy talking to you in person to explore potential opportunities and how I can best serve someone's needs. Please call or e-mail me to arrange a fitting time for us to meet. Thank you for your time and consideration. I look forward to talking to you soon. As my employer is unaware of my job search, I trust that you will hold this email in strict confidence and consult with me before releasing my materials to a prospective employer. Energetic, highly ambitious and organized Schedule Officer with broad experience in Business Administration. Outstanding communication skills. Personable, independent and dedicated to producing top quality work. Thoroughly enjoy a challenge and committed to a long-term career. Pursuing to draw upon the skills and experience acquired across a variety of roles to secure a role in Business Administration. I believe your firm would provide a working atmosphere to which I would be well suited, as well as one where my varied experience in Business Administration would be valuable. My salary requirements are reasonable and negotiable based on the responsibilities and opportunities presented. I look forward to meeting with you to discuss this role. If your company is considering to hire a result-driven and target oriented Schedule Officer then please add me to your list of highly eligible candidates. Schedule Officer with six years of professional experience. Poised, resourceful and adaptable to any environment. Organizational ability to handle numerous priorities and meet deadline schedules. I would like to meet you to talk about my qualifications for the Schedule Officer position. Please call me at the following phone number, or leave a message, to arrange an interview. Thank you for your consideration. Your online job post concerning Switchboard Operator on www.xyz.com caught my eye, and your company name caught my attention. I am very interested in this position as it is an outstanding match for my experience. Greatly reliable Switchboard Operator who reliably exhibits integrity and sound judgement. Verifiable record of low absenteeism and punctuality; performs tasks with interest and efficiency. Well organized with good time-management habits; completes assignments in a timely and accurate manner. Works well independently as well as collaboratively in a team environment. Reputation for outstanding customer relations; easily establishes trust and rapport with public, demonstrating good listening skills. Robust problem-solving abilities; can be counted on to follow through to resolution. I would very much like to talk about with you how I could contribute to your organization. Please contact me at your earliest suitability so that I can clarify my background and enthusiasm for the Switchboard Operator position. Thank you for your time and consideration. Mr. Roger gave me your contact details because he thought that you might be in need of a capable Switchboard Operator as part of your team. Following the latest completion of a Bachelor's Degree in Business Administration from Stanford University, now pursuing to exploit the skills and experience attained in Business Administration by working in the capacity of Switchboard Operator in reputed firm. Energetic and greatly motivated Switchboard Operator with extensive experience in the Business Administration field. Well-developed communication skills with an upbeat and positive attitude. Greatly flexible, honest and punctual, with the capability to stay calm and focused in demanding situations. Dedicated to a job well done and a long-term career. After reviewing my CV, you will discover that my qualifications are a good match for the Switchboard Operator position. The opportunity for a personal interview to talk about employment opportunities further would be mutually beneficial. You can reach me on [mobile] to arrange an appointment. In the meantime, thank you for your time and consideration. As a skillful professional with seven plus years of outstanding track record in the Business Administration field, I believe that I have exclusive capacities that could benefit organizations of all sizes. With this in mind, I have enclosed for your review a CV that briefly outlines my professional history. Skillful and dedicated Switchboard Operator with an exhibited track-record of increasing efficiency, quality and client satisfaction. Skillful in all aspects of Business Administration. Result-orientated and driven professional with a solid work ethic and devotion to excellence. Professional communication, negotiation, conflict resolution, problem-solving skills. Credentials I can bring to your clients are outlined in the enclosed CV. Given my technical skills, familiarity with the product line, and understanding of your clients' needs, I could step into the position and be of immediate assistance. Please contact me at my home phone number to arrange a convenient time to meet. Thank you for your time. I look forward to talking to you soon. Working as a Switchboard Operator for numerous Business Administration businesses in the past six years. I trust that all of this experience will allow me to cope with any similar role very easily. I have the administration, presentation, computer, and people-orientated talents that will have a very helpful impact on this company. I am actively searching for fit Switchboard Operator positions and would like to show my interest in working for an organization like yours. I have faith that my knowledge and expertise would allow me to perform successfully in the Switchboard Operator role. I would enjoy speaking to you in person to discuss in more detail how my credentials ca realize your needs. Please contact me via telephone or e-mail to organize a mutually fitting date and time for us to meet. Thank you for your time and consideration. I look forward to talking to you soon. If your company is planning to hire a qualified and vibrant Switchboard Operator then please check my qualifications to see how I fit I am for this position. A knowledgeable Switchboard Operator with verified track record with many Business Administration companies in the past ten years. I am emphatic that all of this experience enables me to succeed in any relevant role. I possess all the essential and anticipated skills that will have a positive influence on this company. I would welcome the opportunity to be interviewed for the Switchboard Operator position and to discuss the results you can expect from me as a member of your team. Thank you for your time and consideration. Your job posting for Team Lead on www.jobsforus.com caught my attention. I'm very enthusiastic about this opportunity as it is a perfect match for my capabilities. A veteran Team Lead and holder of Master's Degree in Business Administration with robust experience in Business Administration. This blend has allowed me to reliably shine in all roles leading up to my present professional position. Mr. Brookay, the branch manager, advised that I contact you to find out whether there is a vacancy for a Team Lead. I am seeking an opportunity that will enable me to use my training and practical technical exposure in a Team Lead position. As described in my CV, you will find a solid experience in Business Administration with more than three years as a Team Lead. In this capacity, I have established a proficiency in Business Administration. I am self-assured that my knowledge in these areas will prove to be an advantage to [Company Name]. My CV is attached for your consideration. I have faith that I can make a positive contribution to [Organization Name] and look forward to discussing my credentials in detail. I will call you next week to arrange for a meeting at a mutually convenient time. Thank you for your consideration. I would very much hope to join a company where I can learn and grow within the Business Administration profession and build a long-term relationships. With these goals in mind, I have enclosed for your attention and review a CV that briefly summaries my credentials as a Team Lead. I am pursuing your help in sharing my cv with clients have requirements in line with my experience. My expertise as a Team Lead is adjustable to your requirements. I have expended seven years in Business Administration roles labeled as 'get the job done'. My years of practice have also empowered me with a great compassion to the requirements of [clients/staff/seniors]. I have substantial computer knowledge and I am totally computer literate. My verbal and written communication abilities are remarkable. If it appears that my credentials meet the needs of one of your clients, I will be happy to talk about my background further in a meeting with you or in an interview with the client. I will be contacting your office in the near future to determine the status of my application. Specialized Team Lead with ten years of working successfully in Business Administration several businesses. I am a hard-working individual who continuously looks for methods to advance efficiency and precision. In past roles, I brought up techniques to minimize [cost/risk] as well as methods to maximize [production/revenue/satisfaction]. I am committed to the values of quality and constant enhancement. Reflecting on my Team Lead experience within the Business Administration field, it is at this point in my career I am looking for to pursue a long-term personal and professional target of a challenging opportunity as a Team Lead within a renowned organization. If your company is in need for a spirited and tenacious Team Lead then this might just be your lucky day due to my outstanding credentials and experience in Business Administration. Talented Team Lead with outstanding Business Administration experience. Ability to maintain control of work of any size and complexity. Capability to perform autonomously and a preparedness to make choices. I am used to fast-paced ecosystems where deadlines are a primacy and conducting several jobs at the same time is part of everyday routine. I appreciate a challenge and work hard to accomplish targets. A vigorous doer with exceptional personal skills. Concerning your job advertisement for Wayleave Officer on www.quickjobs.com, I am very interested in this opportunity given how close the job description resembles my experience and credentials. With a Master's Degree in Business Administration and over seven years' experience as a Wayleave Officer, I have established a robust experience in Business Administration. Also, I have attained effective skills and a practical understanding of the vital principles and practices linked with Business Administration. My CV will provide more details concerning my education and work experience. If you are looking for a Wayleave Officer who is committed to the highest standards of performance, relates well with others, is self-directing and highly motivated, and is looking for a long-term employment relationship, please contact me to organize an interview. I will make myself available at your earliest convenience. Thank you for your consideration. I look forward to the opportunity to speak to you soon. I have been exploring the leading local organizations in Business Administration, and the name of your company keeps coming up on the top of the list. This confirmed an opinion I've developed over my four years as a dedicated Wayleave Officer. I am looking for Business Administration position that will capitalize on my experience and training as a Wayleave Officer where background and specialized training would make an asset to others. Since [year], I have seized longstanding roles of increased accountability for primary Business Administration establishments as a Wayleave Officer. In these roles, I have proved and continue to prove myself as an accomplished, take-charge team player with an aptitude to synchronize diversified departmental functions. In the course of your search assignments, you may have a need for an organized and goal-directed Wayleave Officer. My present role provides me with the qualifications and experience necessary to successfully fulfil such a position. A multipurpose Wayleave Officer presenting five years of cumulative work experience for institutions in Everton. Well veteran in all Business Administration disciplines with practical training and an outstanding track record. The enclosed summary details some of my accomplishments. I look forward to hearing from you to talk about any mutually beneficial opportunities. Please feel free to pass my CV to others who may have a need for my professional assistance. Highly excited Wayleave Officer with a Master's Degree in Business Administration from The University of Manchester. Successfully [increased/decreased] overall [revenue/production/risk] by drafting and implementing imaginative solutions. Wide knowledge of Business Administration principles and best practices. Capitalizing on a career that encompasses substantial Business Administration experience, I am pursuing a new professional challenge that will utilize my skills in a Wayleave Officer role. Do you need a cross-functional and proficient Wayleave Officer for a fit job in your organization? If the answer is yes, then I would like to offer my services for this role. Pleasant and self-reliant Wayleave Officer thrilled to join a company that acknowledges staff capable of taking advantage of their varied employment experience. Team player with sturdy personal skills to support customers, team members, and business operations. Since a CV can neither totally detail all my skills and accomplishments, nor predict my potential to your organization, I would welcome a personal interview to explore further the merging of my training and knowledge with your needs in the capacity of Wayleave Officer. This e-mail and enclosed CV are in reply to your job post on 7 April for the position of Central Office Operator. Spirited Central Office Operator with ten years of experience in all aspects of Business Administration. Entrepreneurial spirit with established aptitude to make improvements, directly contributing to business evolution and increased success. May we meet soon to talk about your requirements for the Central Office Operator position? I will contact your office next week to organize a mutually convenient appointment, if that is agreeable with you. Thank you for your consideration. I've been meaning to contact you ever since I attended/read/heard about ______. It encouraged me to do a little research, which has convinced me that this is the kind of company I want to be associated with as a Central Office Operator, and that I have the kind of systematic focus combined with resourceful drive that can be successfully applied to your current projects. My objective is to secure a position as a Central Office Operator in the Business Administration domain with an established company repeating the contributions that I have made to my previous employers. Devoted Central Office Operator having more than three years of advanced experience. Confirmed track record of implementing and providing initiatives that positively contribute to a company's bottom line. I am very self-sufficient and able to work autonomously with little direction. I am considered as an information source and enjoy sharing my knowledge with others. As you can see from my resume, I have extensive Business Administration EXPERTISE. I succeeded in [some accomplishment] and I worked as a Central Office Operator for more than seven years. I developed some original ways of [handling tasks or responsibilities] that would be beneficial to your company. For your information, my CV is attached. If any situations come to mind where you think my skills and background would fit or if you have any suggestions as to others with whom it might be beneficial for me to speak, I would appreciate hearing from you. I can be reached on the phone number shown below. Reputed Central Office Operator with an impressive track record in Business Administration within fast-paced and highly competitive settings. You will notice one shared thread throughout my career: I am a lateral-thinking individual and issue solver who knows how to identify needs and attain enterprise wise goals. My objective is to secure a position as a Central Office Operator and to chase new opportunities with a firm providing new challenges while making major contributions to the overall success. Does your company have a requirement for a multipurpose and reliable Central Office Operator? If the answer is yes, then I would like to apply for this position. Known Central Office Operator with performance excellence, an unrelenting results focus, and aggressive implementation for more than eight years, highlighted by n permanent commitment towards ethical business practices. My experience, enforced by strong academic background, has been refined in carrying change that realizes business objectives. I am confident that my devotion and capacity to function as an integral part of your team would allow me to make a major contribution to the company. I would enjoy discussing with you how I ca fulfil your needs in the Central Office Operator role. Please contact me via phone or e-mail to organize a mutually suitable date and time for an initial interview. Thank you for your time and consideration. I look forward to speaking to you soon. This e-mail and attached resume are in reply to job post No. 35286 on 26 August for the role of Data Entry Specialist. Needless to say, I am enthusiastic about this opening and would like to be considered as a serious candidate. Capable Data Entry Specialist with Master's Degree in Business Administration. Having worked as a Data Entry Specialist for more than six years, I find that my position is more of a passion than a job. Total devotion to the [clients/staff] and to the accomplishment of goals of the division and the institute. I have been following the performance of your firm on www.abc.com. With my experience working for one of your direct rivals in Business Administration as a Data Entry Specialist, I know I could make major contributions. I am interested in being listed for Data Entry Specialist position or a similar position at [Firm Name]. Remarkably gifted, award-winning, and self-directed Data Entry Specialist who has made a mark in several aspects of Business Administration environments including administration, direction, relations, and control. I am zealous and animated and ca quickly analyze composite issues in high-paced environments, establish priorities, and formulate effective plans to steadily exceed anticipations with timely and economical results. My strong background in Business Administration supported by extensive experience as a Data Entry Specialist are key assets that I can contribute to one of your client's future success. Working as a Data Entry Specialist for numerous Business Administration firms during the past three years. I have faith that all of this experience will enable me to manage any relevant position very successfully. I possess the management, marketing, computer, and people-orientated skills that will have a very positive impact on this firm. The attached CV summarizes my qualifications and achievements. I would be glad to talk about any of this info with any of your clients if any fit opportunity arises. Thank you for taking the time to review my CV and for your consideration. An experienced Data Entry Specialist with exhibited track record with many Business Administration companies in the past seven years. I am confident that all of this experience enables me to excel in any relevant role. I possess all the necessary and desired skills that will have a positive influence on this company. I am currently pursuing a stimulating opportunity in the role of Data Entry Specialist with a focused, growth-orientated organization. I believe that I can be an asset to your organization and would enjoy discussing further how my knowledge, expertise and professional dedication can address your needs in the Data Entry Specialist position. Please sense free to contact me to arrange either a phone or in-person interview at a commonly suitable date and time. Thank you for your time and consideration. I look forward to talking to you soon. Would you by any chance need a competent and dedicated Data Entry Specialist to be part of your already illustrious team? If so, then I would happily offer my services in the role of the above mentioned role. An experienced Data Entry Specialist having a Master's Degree in Business Administration with robust background in Business Administration. This combination has enabled me to regularly excel in all jobs leading up to my current professional status. Please feel free to contact me at my number: [mobile]. Thank you for your consideration. I am thrilled about working at [ABCD Inc]. My background, professionalism and passion will make me an effective member of your team. This message and the accompanying CV are in answer to the announced job No. 89480 which was posted on 9 December in the role of Records Officer. As detailed in my CV, you will find a strong background in Business Administration with over three years as a Records Officer. In this capacity, I have developed an expertise in Business Administration. I am confident that my experience in these areas will prove to be an asset to [Firm Name]. Recently, I have been researching the local Business Administration field. My search has been focused on looking for corporations that are respected in the field and that prize a commitment to professional development and that is why I am sending you this letter. Capitalizing on my success working as a Records Officer for [ABCD Inc], I am looking for a professional opportunity where I can continue exploiting my skills in the benefit of my employer. My experience as a Records Officer is, I believe, readily adjustable to your needs. I have spent six years in Business Administration positions best described as 'doing whatever has to be done' and have capitalized on my capability to undertake a large and widely diverse range of responsibilities, to learn quickly, and to find effective solutions to problems throughout. My years of experience have also provided me with an unusual sensitivity to the needs of [clients/staff/seniors]. I have substantial PC experience and I am completely computer literate. I have been told my verbal and written communication skills are exceptional. I am writing to you this letter because of your prominent position in the market and your prosperous history in matching proficient professionals with corresponding job vacancies. In this context, I would like to ask for your help in finding for me a suitable vacancy that matches my robust background as a Records Officer. Professional Records Officer with ten years of working successfully in Business Administration organizations across the country. I am a hard-working person who always looks for ways to improve productivity, effectiveness and accuracy. In past positions, I have identified ways to reduce [cost/risk] as well as methods to increase [production/revenue/satisfaction]. I am committed to the principles of quality and continuous improvement. My supervisors have noted my record of 'excellent attendance and dependability' and praised me as 'reliable and greatly determined '. If you trust that you one of your clients could benefit from a highly motivated and capable professional with a reputation for generating results, then I would welcome the opportunity to meet them and talk about the specific value I can offer. I thank you for your consideration and I look forward to speaking to you soon. Qualified Records Officer with exceptional Business Administration background. Ability to maintain control of work of any scale and complexity. Ability to function independently and a willingness to make decisions rapidly and effectively. I am accustomed to a fast-paced setting where deadlines are a priority and handling numerous jobs simultaneously is the norm. I enjoy a challenge and work hard to attain my goals. A robust achiever with exceptional social skills. Currently, I am exploring opportunities in the Business Administration domain where I can contribute in the capacity of Records Officer. Please accept the attached CV in application for a Records Officer position with your organization that will make use of my extensive background in Business Administration. Throughout my career, I have demonstrated my loyalty, commitment to excellence and strong work ethic. I am confident that I will make an immediate and long-term contribution to your company. With a Master's Degree in Business Administration and over six years' experience as a Records Officer, I have developed a solid background in Business Administration. Consequently, I have developed effective quantitative skills and a practical understanding of the fundamental principles and concepts associated with Business Administration. My CV will provide additional details regarding my educational background and professional experience. I have worked successfully both independently and as part of teams. I adapt readily to rapidly changing work conditions and enjoy the prospect of contributing to the organization's reputation and success. Your time in reviewing my confidential CV is greatly appreciated. I will follow up next week to answer any inquiries you may have regarding my qualifications. At that time, I would like to talk about the possibility of setting up a personal interview with you. Please contact me if you would like to speak sooner. I read your advertisement on www.jobvacancy.com for Scheduler and after exploring your company's website I felt I had to respond given the massive connection of the job description and my profile. Since [year], I have held longstanding jobs of increased responsibility for leading Business Administration organizations as a Scheduler. In these positions, I have proved and continue to prove myself as a capable, take-charge team player with an ability to coordinate diversified departmental functions. Combined with my ability to manage and train others proficiently, I am confident that I would be an asset to your organization. I am very interested in joining your team as a Scheduler or similar role that matches my qualifications. A versatile Scheduler offering eight years of cumulative multinational work experience for organizations in Monaco. Well versed in all Business Administration disciplines with practical training and an outstanding track record. Should any questions arise concerning the information on my CV, or if you need personal references, please do not hesitate to contact me through the address or telephone number listed above. Thank you for your time and consideration. I look forward to meeting you. I am forwarding to you my resume in case any of your clients has a need for a qualified and committed Scheduler. Highly self-motivated Scheduler with a Bachelor's Degree in Business Administration from Harvard University. Successfully [increased/decreased] overall [revenue/production/risk] by conceptualizing and implementing inventive solutions. Extensive knowledge of Business Administration principles and best practices. While my CV is comprehensive, it does not fully demonstrate the manner in which I have achieved success. My character, personality and the ability to lead a project or team successfully could be demonstrated in a personal meeting. Therefore, I would welcome an interview to talk about your client's needs and my qualifications further. Thank you for your time and consideration. Personable and self-reliant Scheduler enthusiastic to join a company that rewards staff skillful of leveraging their varied employment experience. Team player with strong social skills to support customers, team members, and business operations. An active listener and good conversationalist with exceptional face-to-face and telephone communication skills. Patient and persistent; exhibits natural talent for gaining trust and asking the right inquiries to recognize needs and provide solutions. Exceptional role for simultaneously managing multiple responsibilities and priorities without compromising on quality. Objective is to land a job as a Scheduler working in an exciting and professional setting with personal development and development possibilities and to accomplish company's target through professional ethics, genuine commitment and hard work. I would very much like to discuss career opportunities with [ABCD Inc]. I will be calling you within the next few days to set up an interview. In the meantime, if you have any questions I may be reached at the [mobile]. Thank you for your consideration. Please accept this letter and the enclosed CV as an expression of my interest in the Scheduler position you are currently looking for to fill. I am confident that my education, experience provide me with the necessary skills to meet or exceed your expectations in this role. Spirited Scheduler with more than nine years of experience in all aspects of Business Administration. Entrepreneurial spirit with proven ability to make improvements, directly contributing to business development and increased profitability. Particular strength supervising people and controlling financial matters. I would appreciate the opportunity to meet you to talk about your goals and how I can help you meet them. I will call you soon to organize a meeting. In the meantime, please sense free to call for further info on my background and experience. Thank you for your attention and reply. I look forward to meeting you in the near future. I saw your job post for Implementation Manager on www.vacancy.com and after investigating your organization's website I felt I had to reply given the tremendous resemblance of the job description and my profile. Committed Implementation Manager possessing more than six years of progressive experience. Exhibited track record of executing and supplying initiatives that positively contribute to a company's bottom line. I am very self-sufficient and able to work independently with little supervision. I am regarded as an information resource and enjoy sharing my knowledge with others. I also enjoy managing projects and planning meetings, trips and special events. I welcome the opportunity to elaborate on how I could make a significant contribution to your company as an Implementation Manager. I look forward to talking to you soon. Thank you. Lately I have been examining the leading local companies in Business Administration. My search has been for companies that are respected in the domain of Business Administration and that provide ongoing training programmes. The name of [Organization Name] keeps coming up as a top company. Presently looking for a diversified and stimulating career in the Business Administration field, preferably as an Implementation Manager. Growth-oriented Implementation Manager with more than three years of experience in the Business Administration domain. Deep understanding of core disciplines pertaining to the Business Administration field backed by extensive practical training. Does any of your clients have a requirement for an ambitious and talented Implementation Manager? If so, then please share my CV with them because I trust I have the knowledge and experience to outperform in such a capacity. As you can see in my resume, I have broad Business Administration experience. I succeeded in [some achievement] and I worked as the Implementation Manager for more than eight years. I developed some pioneering ways of [handling tasks or responsibilities] that would be valuable to your company. Reputed Implementation Manager armed with a commanding track record in Business Administration within fast-paced and highly competitive landscapes. You will notice one common thread throughout my career: I am a lateral-thinking negotiator and issue solver who knows how to identify requirements and accomplish department and company-wise business objectives. With this vibrant approach, I have successfully attained recognition for consistent first-ranking accomplishments in Business Administration. Looking to secure a stimulating Implementation Manager position within a forward thinking, progressive technology oriented company. I believe my skills and experience will make me succeed in the position of Implementation Manager. Kindly review my CV, then contact me at your earliest convenience to schedule a professional interview. The purpose of this communication is to introduce myself as a prominent Implementation Manager and then to possibly meet you to discuss an opportunity to join your organization. As a prominent graduate of University of Chicago and cross-functional Implementation Manager, I ca successfully assist you quickly and with minimum training on a full-time, part-time, freelance, or short-notice basis. I offer strong organizational and clerical skills acquired from employment as an Implementation Manager for more than ten years. Also, I have successfully [planned/delivered/achieved something]. In addition, my referees will attest to my capacities to stay calm, cool, and collected during 'crisis' situations. Exceptional well-honed problem and interpersonal skills gained thought diverse settings and setups.